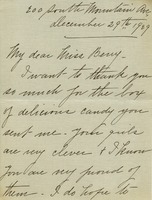 In this letter Charles Swift writes to Miss Berry thanking her for the box of candy that came from the Berry Schools. Brooks Margao says that they will supply the schools with candy in the same amount as last year. 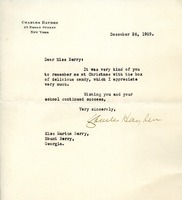 Ellen thanks Martha Berry for her thoughtfulness during the Christmas season. 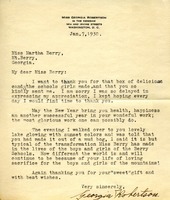 Grace thanks Martha Berry for the Christmas gift and wishes Miss Berry a successful new year. 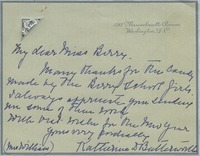 Charles Hayden thanks Martha Berry for thinking of him during the Christmas season. 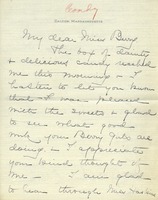 Miss Clara L. Crane thanks Martha Berry for the box of candy she received. 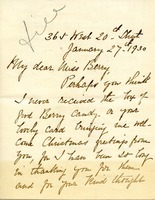 Mr. Clements sends thanks to The Berry Schools for remembering he and his wife in the Christmas season. Mrs. Campbell thanks Miss Berry for the candy she sent over and hopes to visit the schools one day. 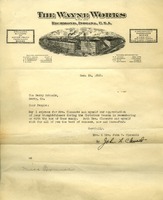 Mrs. Campbell also mentions that she will be taking the place of her sister at the above address. 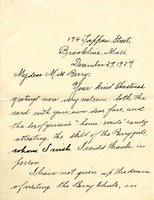 This is a thank you letter to Miss Martha Berry for a box of candy made by the girls at Berry and sent to Margaret Browne. 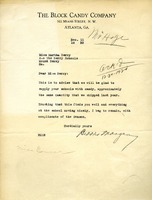 She also extends her thanks for the lending of portraits of Miss Berry and an aunt for exhibition in Atlanta and New York. 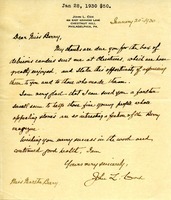 Browne is hopeful that the portraits have been safely returned. 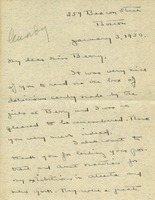 Clare Weber writes to Martha Berry thanking her for the candies she mailed.